The strength of any material is largely depends on the internal stresses, strains or forces present in the material. In a structure or machine the consideration of the stresses are one of the most essential things during the design and preparation of the structure. The designer should have complete knowledge of the stresses to prepare a safe design. Two very important forces are need to be understood while designing a structure, forces or stresses are tension and compression. These internal stresses are present in every material or structure. ‘Tension’ is the force that pulls out the material axially in both the opposite directions. ‘Compression’ is the force that pushes the material axially from both the ends of the material. Material is widely classified on the basis of its ability to withstand these stresses. Some materials are good in withstanding the tension and some are good with compression. The material's ability of resisting the stresses is one of the most important criteria for selecting a material to build a strong structure. 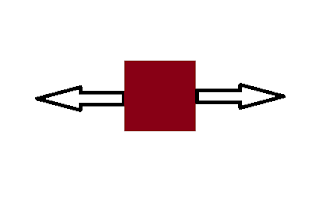 Tension force acts outward to a specimen in both ends. It is pulling of material along an axis. Imagine the force experienced by a rope in the game of tug of war. The Rope is pulled from both ends and the force experienced by the Rope is tension force. In The structures bridges, belt pulley, rope pulley etc. This force is present in these system. Compression force act inward to a specimen in both ends. It is pushing of the specimen from both ends along an axis. 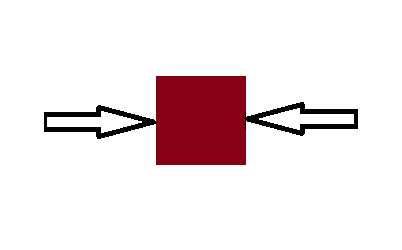 When a small shaft is pushed from both ends or a spring is pushed from both ends the string collapse. In both cases and the spring will experience a compression force. While building a bridge these forces must be considered because tension and compression both are present in all the bridges. These forces can lead to the damage in the bridge if not measured and controlled. Bridges or structures are able to sustain the varying loads. So that tension and compression should be tested in varying loads in the bridges if tension and compression is not controlled in varying loads the bridge can lead to buckling. When tension force is applied on the specimen, the material tend to elongate axially. Then the internal forces develop inside the material as the reaction force to the applied force. This force resist the applied external force. This internal stress called tensile stress. So the tensile stress is the initial resisting force per unit area. Where is the cross sectional area of the object. The tensile stress widely depends on the cross section of the object. This can be proved by performing tensile test on the cylindrical bar of different cross sections. For larger area we need more force or are breaking load then as in smaller cross sectional area objects. Intensity of force is a major factor in the specimen. This intensity of force is called stress. Compressive stress has opposite nature as of tensile stress. Because the contraction of size of the object happens. A squeezing force is applied that results in compressive stress in the material. This stress is also defined as the force per unit area, same as the tensile stress. Used to denote the compressive stress is also same. When compression force is applied in the object, the compressive stress generate inside the body to resist applied force. The formula is same for compressive stress. The compressive or tensile stress is recognized as per the direction of forces acting on the body. The magnitude of compressive stress depends on the compressive force applied on the object. Tensile and compressive force acts perpendicular to the surface of the object. That is why these are called direct stresses. One has to recognize whether the stresses are tensile or compressive by the direction of forces acting on the object because this is what the main difference between them. Strain also depends on the type of force applied on object because inland happens according to the direction and nature of force. When tensile force is applied to the object, the object tend to elongate and the length of the object increases. The ratio of the change or increment in the length and the original length is called tensile strain. When compressive force is applied on the specimen, then it turned in contraction in the size of the specimen. The ratio of change or size contraction in the length and the original length of the object is called compressive strain. Due to the contraction in size a negative (-) sign is used in the formula of compressive strain. Strain is a non-dimensional quantity and a key factor while studying elastic properties of Material because theory of elasticity totally depends on the study of stress and strain. The negative sign in compressive strain is very important while solving the problem related with stress and strain. 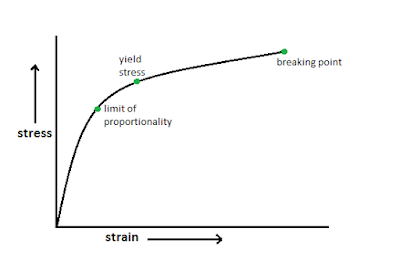 Stress-strain curves are very essential tool to analyze the properties and performance of a material. In the tensile test, a curve is drawn between the stress and strain. The curve has the information of tensile strength, yield point, breaking point etc. This curve helps in the analysis of the important properties of Material and behavior of that material under load. The tensile test is performed in the brittle material such as high speed Steel. Tensile stress is applied until the material rupture takes place. Due to brittleness the breaking of material will not take much time and elongation of the material will be less. Stress is applied till the material breaks. The curve generated in the graph can provide bit information about the material. In the beginning, car starts with a straight line. Till this line ends in the curve material remains elastic and follows hooks law. Then on increasing the stress, the plastic deformation of the material starts and strain starts increasing and there is a bend in the curve can be seen. Before the bend in the curve start, the material follows hooks law. 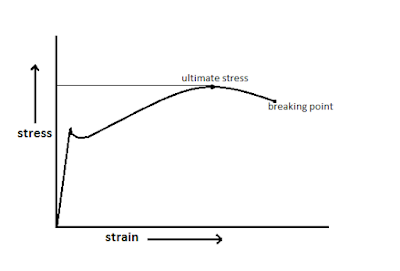 That is why the stress-strain curve is linear. On the application of more stress limit of proportionality is crossed and non-linearity in the graph curve starts. After this the permanent elongation in the material occur till we remove the load. 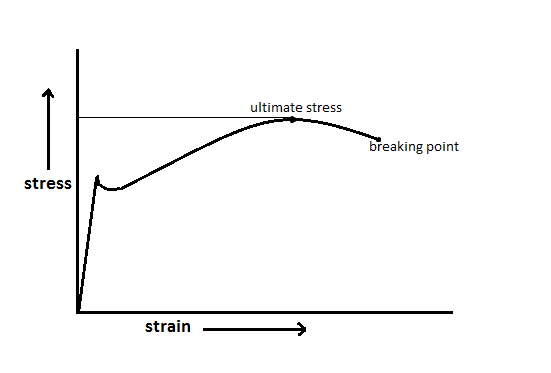 The stress-strain curve for tensile and compressive load are quite similar. The difference is the limit of proportionality and stress applied. The loading condition can be very different in both the kisses. Ductile material shows more elongation in the object then brittle material in the tensile test. In the ductile material breaking of object happens after a bigger elongation in the material. Materials like low carbon steel, brass, copper, aluminum, polymers are some examples of ductile material stretched into bigger length. The stress-strain curve of ductile materials is very different from brittle material. When the load starts to apply on material the curve first goes as a straight line. Then on increasing load father, we have to decrease it immediately to balance the equilibrium. Due to this sudden reduction in stress, a spike in the curve occurs. After this the strain in the material start increasing. At a point where stress attains its maximum value but strain keep increasing even after that. This week value of stress is called 'ultimate stress'. One of the reason of increasing strength after ultimate stress is the reduction in cross sectional area of the object. At the end of the curve the rupture in the material happens. The reduction of cross sectional area in tensile load is called 'necking'. The stress-strain curve in the compressive test is quite similar to the tensile test. But the curve in the compressive test is drawn on the negative axes. While performing a tensile and compressive test, it is difficult to define yield stress of the material. 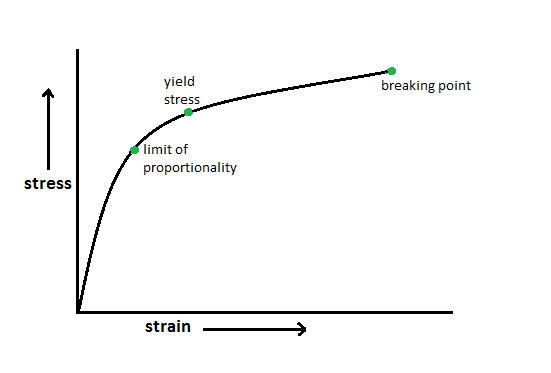 Theoretically proof stress is similar to yield stress but in the tensile compressive test the exact position of limit of proportionality is difficult to determine. Because of this problem the term 'proof stress' is introduced. Definite amount of stress required to generate the fix value of strain. Like 0.1% stress of total load produces 0.1% of the strain. So the proof stress is the point where permanent formation occur in material testing. When a material is subjected to the stress for longer i.e. the continuous stress is applied on the material the slow deformation with the stress takes place. When the temperature below the limit of proportionality, the deformation in the material happens slowly when the temperature is increased the material undergo to creep more rapidly. In this process the strain in the material developed and this strain is called creep. Fatigue is little different from creep. That type of stress in the fatigue is cyclic loading. When a material is subjected to cyclic loading. After a time period the strain starts to develop in the material. This strain starts developing even at the lower value of stress than yield stress. Due to cyclic loading minute cracks in the material starts developing which is caused by stress concentration on the material. Tension and compression is basics in the subject of strength of material. That is why it is very important part of this subject. The study of stress is very crucial part of studying the nature of a structure. There are more many type of stresses which material has to sustain. But the direct stresses like tensile and compressive stress are most important one. During the designing of any structure, machine, bridge this direct stresses has to consider for a successful design preparation.